ISBN: 9782090381832 ISBN10: 2090381833. Written by: S. Billaud. Softcover, 128 pp.. 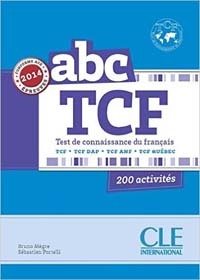 Offered in more than 80 countries, Le Test de Conaissances du Francais (TCF) is a tool for the evaluation of your students' knowledge of French. The TCF will allow the student to enter into the 2nd level of the DELF or the DALF. The book includes explanations, tests, answers, and transcripts for the oral questions; the CD ROM offers training through timed activities to prepare your students for success. ISBN: 9782090333480 ISBN10: 2090333480. Written by: Sylvie Pons. This book,conceived by the Chambre de Commerce et de l'Industrie de Paris, is accompanied by a CD and is designed for students who are preparing for the TEF. Various written documents accompanied by sound tracks and exercises help the student practice the written and oral skills that are required to pass the test. It also contains a sample test, answer key, and transcripts. ISBN: 9782090323160 ISBN10: 2090323167. Written by: Sylvie Pons. This book,conceived by the Chambre de Commerce et de l'Industrie de Paris, is accompanied by a CD and is designed for students who are preparing for the TEF. Various written documents accompanied by sound tracks and exercises help the student practice the written and oral skills that are required to pass the test. It also contains a sample test, answer key, and transcripts.